Having been drawn into the world of Marvel through the Thor movies, I was really excited to have Thor’s part in this collection arrive. I did try to wait… but I couldn’t resist, since in movie verse, I’d class Thor as my favourite Marvel superhero. I was interested to see Thor’s first appearance. While it was confusing to see an apparently ordinary mortal be able to become Thor, but still retain his memories as Donald Blake, I think the information at the end (and what I’ve read in previous volumes) explained things fairly well. 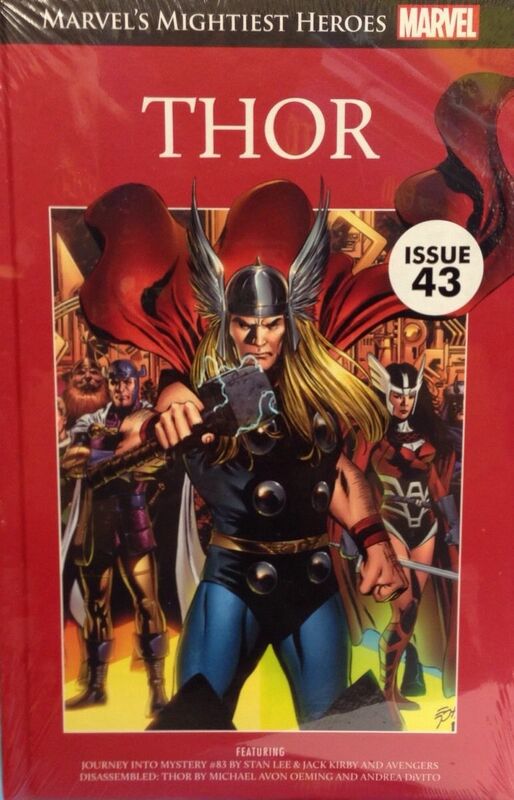 I did notice the big contrast between Thor’s first appearance and the final set of comics. It was intensely sad to see Thor choose to send his Avenger friends back to Earth, rather than let them fight alongside him. And although I knew what was likely to come with it being Ragnarok, I was still drawn into what was happening with the characters and I cared about their fates. I didn’t get to see much of Thor acting as more of a hothead, but it was interesting to see how he’d matured in the second set of comics. I enjoyed seeing the brotherhood he shared, not just with his fellow Asgardians, but with his friends from the other realms as well. I thought it was interesting to get glimpses of some of the other realms. While there didn’t seem to be much going on in Earth, the other realms were clearly affected. And it was good to be able to see various others, such as glimpses of Fenrir and Jormungand… also Hela. It was a bit disappointing that many of the villains didn’t seem to have much in the way of redeeming qualities, though. I thought it was good to see that Thor had to make sacrifices and that, although he was reluctant to do so, he still did what was needed. I thought it was especially scary to learn about the cycles, though I would have liked to know a few more details about how it all worked. Although Thor isn’t my favourite Marvel character in the comic verse, it was good to see his origins and I do like him as a superhero. In the future, I do hope to read more of his comics… and I’d especially like to see more of his relationship with Loki.